At Old Dominion Animal Hospital, we use digital dental radiography for all of our animal dental x-rays. The digital radiographs give us extremely clear dental images to better diagnose your pet’s dental health. 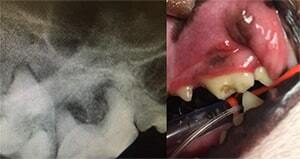 These digital x-rays also allow us to easily show you images of your pet’s teeth. Be sure to talk to us about your pet’s dental exam. Full mouth animal dental x-rays are included in every dental procedure that we perform. Radiographs of the tooth roots are the only way to know for sure whether a tooth is truly healthy and guide us in our decisions about extractions.